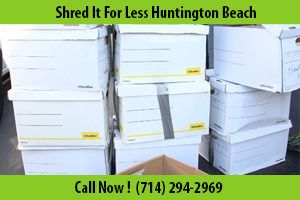 Document destruction is easier than ever for those in and around the Huntington Beach area. With services suitable to countless different needs, from dispensing unwanted credit card offers to ensuring that client accounts and proprietary corporate information don’t get into the wrong hands, Shred It For Less is ready to meet the paper shredding needs of individuals and businesses concerned with protecting their privacy and the privacy of those with whom they come into contact. Our convenient document shredding services locations and mobile shredding service options provide something for everyone. Drop off Shredding services is the perfect option for individuals and small businesses that don’t have large-scale document destruction needs. Simply drop by our convenient secure document shredding location in Huntington Beach and watch our on site shredding industrial document shredder at work. You’ll quickly be able to go about your day confident that your sensitive information will not get into the wrong hands. Those of you who want to make the most of our convenient location will likely want to drop your documents along with your names and addresses so that we can send you a Certificate of Destruction, an official record that you employed document destruction services in case any issues arise in the future. Although most individuals won’t have a need for this certificate, it’s a great option for businesses that want to be able to provide their clients with proof that their sensitive information has been treated carefully and with maximum concern for their privacy. Large businesses, and even some smaller and medium sized ones that still use a lot of paper, may want to make use of our mobile document shredding option. This is perfect for busy offices that don’t have time to send someone to make multiple or frequent trips out of the office bringing their documents to us, or that can’t afford to have a staffer spend valuable time paper shredding for hours on end. Simply call us and we’ll send one of our units to your facility at a convenient time and destroy your documents on site in front of your eyes. Many employers that would normally not be involved as something tedious as document destruction may get extra peace of mind from seeing their proprietary documents destroyed for themselves. All employers will be happy to save their employees’ precious time from a task that should be done quickly, efficiently, and, to the greatest extent possible, mechanically. Document destruction no longer has to be a task assigned to a child as punishment or the employee who draws the short straw. Shred It For Less shredding company has rendered this once inconvenient task easier and less time-consuming than ever, leaving you with no reason to put off or altogether avoid one of the best ways to get rid of private financial, legal, medical, and business information. With nothing to lose but that nagging concern that your identity could be stolen or that your Saturday afternoon could be spent shoving papers into a document shredder, why would not you use Shred It For Less in Huntington Beach?